The best plants for every tricky spot in your home. As one recent Sweet Digs resident said, "Plant ladies are the new cat ladies." And judging from the range of green thumbs we're seeing all over Instagram, we have to agree. But not all of us live in pleasant, airy, sunny spaces made to cultivate oxygen-creating life. In fact, the majority of city real estate (unless you have cash to spend) consists of dark corners, humid rooms, and that one radiator that always dries out your skin and those $2 Whole Foods herb pots. 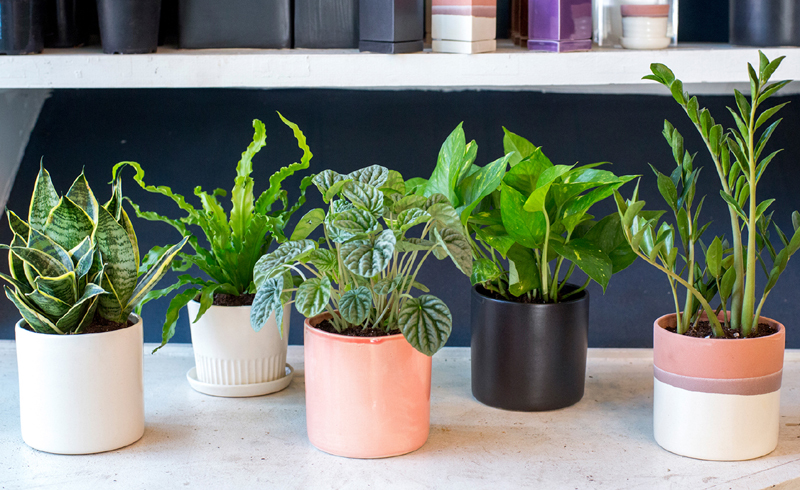 So ahead, we talk to the folks at plant-to-door delivery service Bloomscape, as well as the pros at Sprout Home, to find the best plants for all your not-so-plant-friendly corners. From windowless rooms to non-ventilated kitchens to that dry spot right above your radiator, these foolproof plants should be able to survive even the dreariest of rooms. The classic windowless room is a staple of railroad apartments, 1-bedroom to 2-bedroom converts, and studios that basically face another building's wall. 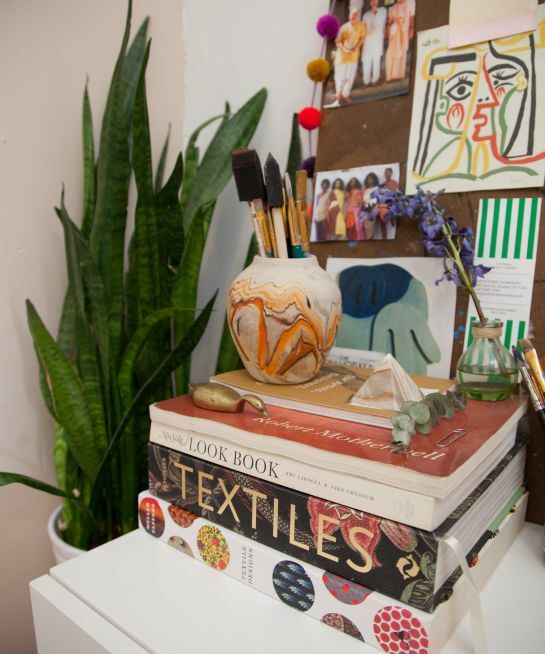 "All plants need to have some sort of light source in order to photosynthesize," Tara Heibel of Sprout Home tells Refinery29, but if you have that one spot in your windowless room that gets some light, you could put a plant there. Luckily, there are a few plants that can survive incredibly low-light situations — but not necessarily no light situations. Resident "plant mom" Joyce Mast at Bloomscape recommends two types of aglaonemas: The Cutlass Aglaonema and Silver Bay Aglaonema. "Interestingly enough, they can adapt to fluorescent lighting," Mast tells Refinery29. Of course, a more diffused natural light could help these lush plants grow faster, but if you're just looking for something that won't die, these are worth a shot. If all else fails, though, Heibel recommends getting a grow light to mimic filtered or ambient light, giving your plant a little boost. 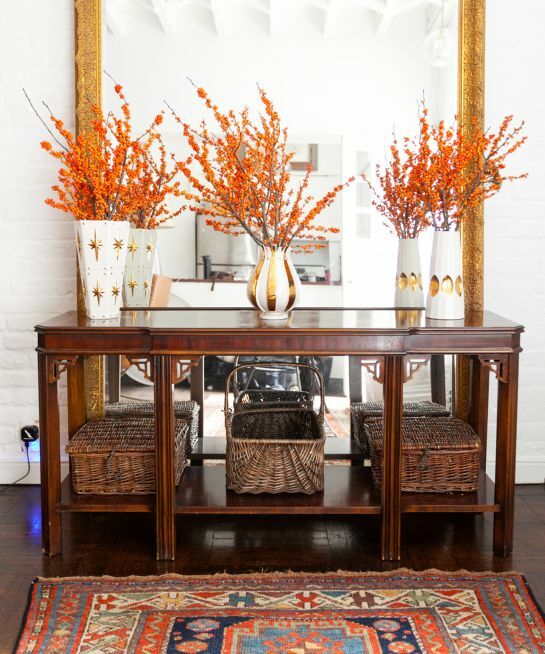 Or, just call it a day and find dried plants that still make a visual statement. This isn't so much a problem during the summer, but even around an air conditioner, plants can dry out. "Plants like to be calm and steady in their care," Heibel says. "If the temperature changes rapidly, any plant will get a little upset." 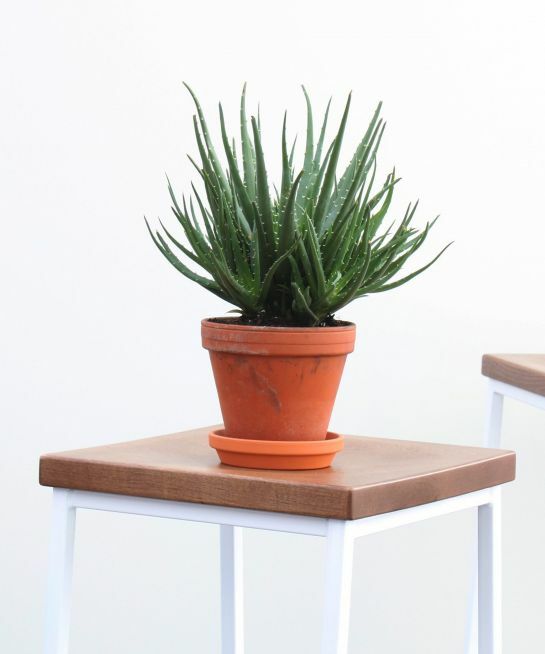 Succulents might be strong enough to survive this tricky spot, like the ponytail palm ("essentially a succulent even though people don't think of it like one," Mast says) and the hedgehog aloe, a spiky succulent that's also great for dry skin (bonus!). For something more lush, look for plants with thicker leaves. "The thinner the leaf, the more apt they are to lose moisture and dry out," Heibel says. Both Heibel and Mast suggest the ever-popular sansevieria, or mother-in-law's tongue, which can essentially survive anything. "It does best in moderate to indirect light to low light, and it doesn't require extra humidity," Mast says. "So it could be sitting next to a radiator and you don't have to worry about it at all." Just don't let the plant actually touch the radiator. 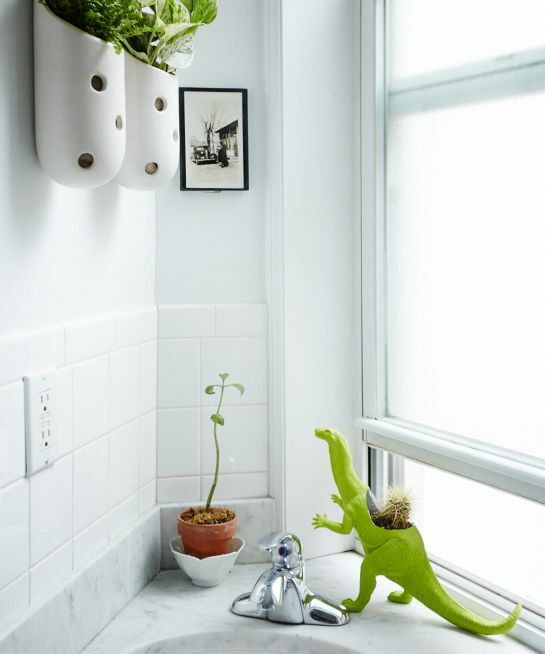 Bathrooms — literally the opposite of your radiator-dry room — are actually great spots for plants that love humidity, especially if you have some natural light coming in. For well-lit bathrooms, Mast recommends a pinstripe plant, while a lower-lit bathroom could be a great home for a rattlesnake plant. Even better are ferns. "Ferns will definitely pull humidity out of the air, which is why they'll do so well in a bathroom," Heibel says. If you're looking for a super lush, tropical-feeling bathroom, Heibel recommends the Macho fern. "It creates a lush, woodland environment, with broad leaves to visually cover a corner," she says. The only catch: "They love to be evenly moist, so it might be a problem for someone who goes out of town a lot." In the winter, you might even have to mist your fern to get it through those cold, dry months. Air plants could also work in this space, if you want something without dirt. "They take water and nutrients in through their bodies, so they do take in more of the natural humidity, and you don't have to fully saturate them in water all the time," Heibel says. Of course, caring for air plants will depend on where you live and what the climate is — adjust accordingly depending on seasons, air conditioning usage, and more. Everyone wishes they could grow herbs in their kitchen, but the truth is, herbs are tricky. "Most of those guys need direct rays and even moisture," Heibel says. "You really need to be on top of them." If you have direct sunlight and you swear you water regularly, and those suckers still keep dying, Heibel recommends repotting your herbs into a larger pot with good potting mix. "The more soil you have around something, the more water retention," she says. Herbs that are slightly hardier could deal with less water overall — think French lavender, which can be kept inside all seasons, and thyme. 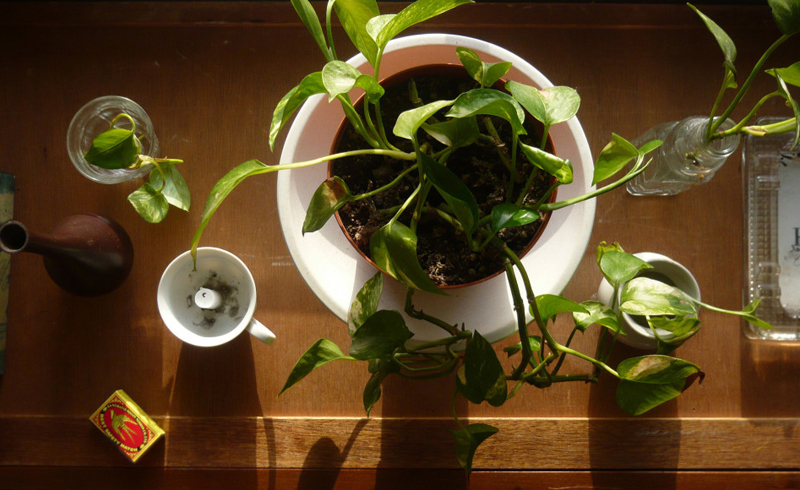 For the less fortunate of us without direct light in their kitchen, plants with hardier leaves like a rubber tree or a cute croton might be a better option — albeit not edible. 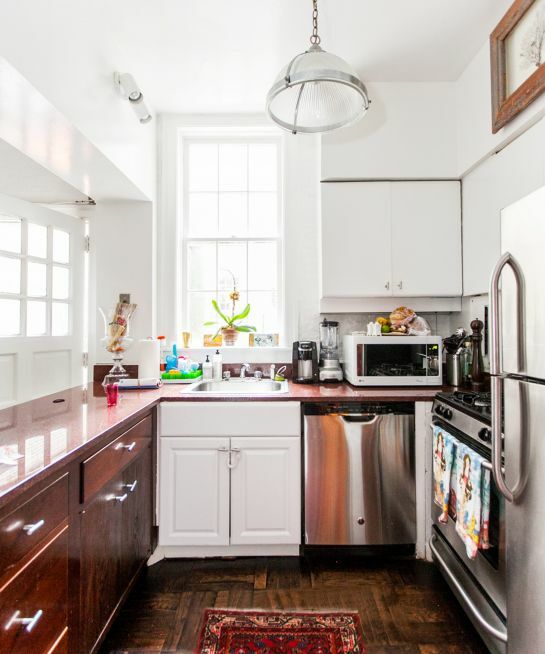 "Your kitchen will have more humidity and be warmer, but can be oily," Mast says. "You want plants with leaves that are tougher so they can hide oil spots, but are also easy to wipe down with a little bit of soapy water." Ever wonder why you keep seeing snake plants all over Instagram? It's because they can handle almost anything — droughts, cold spins, and dark corners — all while looking lush and vibrant. "It's a total throwback to the 1970s look, which is fabulous, and they're good for travelers because they want to dry out in-between waterings," Heibel says. Better yet, they oxygenate at night, which means they're perfect for improving air quality in your bedroom. Wins all around.